For other uses, see Cirque (disambiguation). The concave shape of a glacial cirque is open on the downhill side, while the cupped section is generally steep. Cliff-like slopes, down which ice and glaciated debris combine and converge, form the three or more higher sides. The floor of the cirque ends up bowl-shaped as it is the complex convergence zone of combining ice flows from multiple directions and their accompanying rock burdens: hence it experiences somewhat greater erosion forces, and is most often overdeepened below the level of the cirque's low-side outlet (stage) and its down slope (backstage) valley. If the cirque is subject to seasonal melting, the floor of the cirque most often forms a tarn (small lake) behind a dam which marks the downstream limit of the glacial overdeepening: the dam itself can be composed of moraine, glacial till, or a lip of the underlying bedrock. The fluvial cirque or makhtesh, found in karst landscapes, is formed by intermittent river flow cutting through layers of limestone and chalk leaving sheer cliffs. A common feature for all fluvial-erosion cirques is a terrain which includes erosion resistant upper structures overlying materials which are more easily eroded. Glacial cirques are found amongst mountain ranges throughout the world; 'classic' cirques are typically about one kilometer long and one kilometer wide. Situated high on a mountainside near the firn line, they are typically partially surrounded on three sides by steep cliffs. The highest cliff often is called a headwall. The fourth side forms the lip, threshold or sill, the side at which the glacier flowed away from the cirque. Many glacial cirques contain tarns dammed by either till (debris) or a bedrock threshold. When enough snow accumulates it can flow out the opening of the bowl and form valley glaciers which may be several kilometers long. Eventually, the hollow may become a large bowl shape in the side of the mountain, with the headwall being weathered by ice segregation, and as well as being eroded by plucking. The basin will become deeper as it continues to be eroded by ice segregation and abrasion. Should ice segregation, plucking and abrasion continue, the dimensions of the cirque will increase, but the proportion of the landform would remain roughly the same. A bergschrund forms when the movement of the glacier separates the moving ice from the stationary ice forming a crevasse. 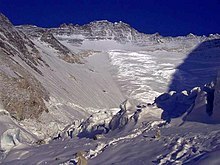 The method of erosion of the headwall lying between the surface of the glacier and the cirque’s floor has been attributed to freeze-thaw mechanisms. 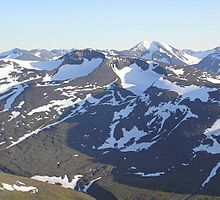 The temperature within the bergschrund changes very little, however, studies have shown that ice segregation (frost shattering) may happen with only small changes in temperature. Water that flows into the bergschrund can be cooled to freezing temperatures by the surrounding ice allowing freeze-thaw mechanisms to occur. Where cirques form one behind the other, a cirque stairway results as at the Zastler Loch in the Black Forest. As glaciers can only originate above the snowline, studying the location of present-day cirques provides information on past glaciation patterns and on climate change. Although a less common usage,[nb 1] the term cirque is also used for amphitheatre-shaped, fluvial-erosion features. For example, an approximately 200 square kilometres (77 sq mi) anticlinal erosion cirque is at 30°35′N 34°45′E﻿ / ﻿30.583°N 34.750°E﻿ / 30.583; 34.750﻿ (Negev anticlinal erosion cirque) on the southern boundary of the Negev highlands. This erosional cirque or makhtesh was formed by intermittent river flow in the Makhtesh Ramon cutting through layers of limestone and chalk, resulting in cirque walls with a sheer 200 metres (660 ft) drop. The Cirque du Bout du Monde is another such a feature, created in karst terraine in the Burgundy region of the department of Côte-d'Or in France. Yet another type of fluvial erosion formed cirque is found on Réunion island, which includes the tallest volcanic structure in the Indian Ocean. The island consists of an active shield-volcano (Piton de la Fournaise) and an extinct, deeply eroded volcano (Piton des Neiges). Three cirques have eroded there in a sequence of agglomerated, fragmented rock and volcanic breccia associated with pillow-lavas overlain by more coherent, solid lavas. A common feature for all fluvial-erosion cirques is a terrain which includes erosion resistant upper structures overlying materials which are more easily eroded. ^ This concern is not new, see Evans, I.S. & N. Cox, 1974: Geomorphometry and the operational definition of cirques, Area. Institute of British Geographers, 6: 150–53 regarding term usage. ^ Knight, Peter G. (2009). "Cirques". Encyclopedia of Earth Sciences Series: Encyclopedia of Paleoclimatology and Ancient Environments. Cirques. 1358. Springer Netherlands: . pp. 155–56. doi:10.1007/978-1-4020-4411-3_37. ISBN 978-1-4020-4551-6. ^ Evans, I.S. (1971). "8.11(i) The geomorphology and Morphometry of Glacial and Nival Areas". In Chorley R.J. & Carson M.A. (ed.). Introduction to fluvial processes. University paperbacks. 407. Routledge. p. 218. ISBN 978-0-416-68820-7. Retrieved 2010-01-24. ^ a b Johnny W. Sanders; Kurt M. Cuffey; Jeffrey R. Moore; Kelly R. MacGregor; Jeffrey L. Kavanaugh (2012). 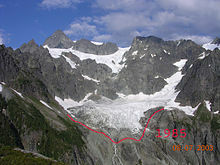 "Periglacial weathering and headwall erosion in cirque glacier bergschrunds". Geology. 40 (9): 779–782. Bibcode:2012Geo....40..779S. doi:10.1130/G33330.1. ^ "Mt Field National Park: Landforms, Flora and Fauna". Parks and Wildlife Service Tasmania. Retrieved 2009-05-12. ^ Barr, I.D. ; Spagnolo, M. (2015). "Glacial cirques as palaeoenvironmental indicators: Their potential and limitations". Earth-Science Reviews. 151: 48. doi:10.1016/j.earscirev.2015.10.004. ^ John O'Dwyer. "Go Walk: Coumshingaun, Co Waterford". The Irish Times. Wikimedia Commons has media related to Cirques.